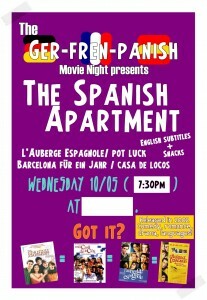 Halloween is getting closer, and the next four French Movie Nights will gradually take you there ! We’ll start the month with a story full of humour and adventures in Paris in the early 20th century: Adèle Blanc-Sec, who could be described as a French and feminine version of Indiana Jones, will be confronted to the waking up of mummies and dinosaurs that shouldn’t have come back to life ! One week later, we’ll rediscover a fairy-tale that is supposed to take place in France, in a dark forest, in a dark castle, where beauty and monstruosity are sometimes not that different from each other. Jean Cocteau’s “Beauty and the Beast” will also be the first Black & White movie this year ! Right before Halloween, we’ll step back to the present and witness the reunion of two highschool friends in “With a friend like Harry…” If your best friend was a talented writer too busy taking care of his family to use his talent, how far would you be ready to go to get him to write again? And finally, we’ll celebrate Halloween a bit longer with “Pars Vite et Reviens Tard” (“Have Mercy on Us All”) on November 2nd… People are dying in contemporary Paris, and all the clues tend to suggest the impossible: the return of the Black Plague! The last two trailers don’t have subtitles, but of course the movies will have them ! – When ? On Wednesday evenings, at 7:30PM. – What ? AWESOME MOVIES, FREE SNACKS AND DRINKS, AND LOTS OF AMAZING PEOPLE !!! SEE YOU NEXT WEDNESDAY ! This Wednesday, at 7:30PM, in SML B17 (the auditorium in the basement of Smullin), the Departments of French, German and Spanish join forces to present a wonderful movie about international travels and exchange students in Europe ! 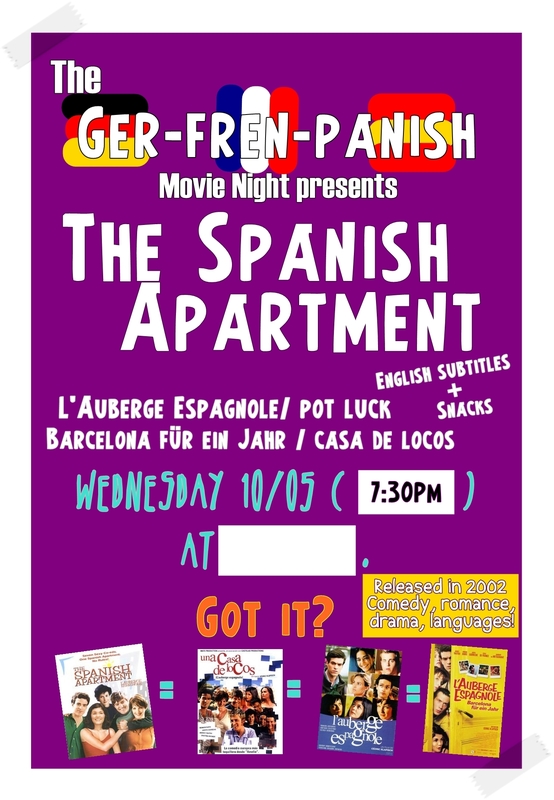 “L’auberge espagnole”, also known as “The Spanish Apartment”, “Casa de Locos”, “Pot Luck” or “Barcelona für ein Jahr”, is a catchy movie about a French student who goes on an exchange program in Barcelona. Long-distance relationship, discovery of a new culture, elaboration of new friendships, transformation of the self… This movie takes you to Barcelona with the characters, who come from everywhere in Europe, and gets you to experience, for about two hours, the intensity of the life of an exchange student in Europe. Whether you are planning to travel or not, this is a great opportunity to spend a very good evening with your friends, and to imagine or to recognize all the situations you might (have) encounter(ed) some day. Plus, there will be free snacks and beverages, and probably many people as the three departments are advertising the movie. The location should be announced some time tomorrow: I’ll update this post and the announcement on WISE. I love this movie, even though the French character is not my favorite, and I think it’s really worth seeing it. Really. And the music is so catchy that it’s been stuck in my mind the entire week-end (but I don’t mind it). 😉 So, this Wednesday, don’t miss the opportunity of having great time !